The housing market may be in the toilet, but you wouldn’t know it by looking around Hamtramck. The city is undergoing a massive housing development project that will eventually fill up almost every empty lot as well as refurbish a number of existing houses. For the past few months, the first leg of this project has been underway. Thanks to a $15 million gift from the Obama administration, Hamtramck also gets a two-for-one. The black residents said “urban renewal” was more about getting rid of African-American residents rather than making improvements to the neighborhoods. The city eventually agreed to build 200 housing units to resolve the lawsuit, but that agreement was long in coming. It wasn’t until about 10 years ago that a development agreement was completed, and it won’t be until another two or three years for all of the housing units to be constructed. About 96 houses have been built so far. The latest development plan calls for building or rehabbing 104 houses. The first leg of construction comes under the auspices of the Michigan State Housing Development Authority. MSHDA is building 22 dwellings, most of which are two-family structures. Four existing houses will be renovated. The project is aptly called “The Sarah Garrett Homes” – named after the woman who came to symbolize the housing lawsuit. This part of the development project is perhaps the most unique. They will remain rental dwellings for 30 years, and the structures will be maintained through a contractor, which includes replacing broken windows, removing snow and cutting grass. The units already have tenants lined up. The next two phases of the development involve the city and Wayne County. The city will be building or rehabbing 39 dwellings. The county’s portion is 30 houses. Both the city’s and state’s houses will be sold at a super-low price of about $50,000. The three separate development projects are spread all throughout the city. The state’s portion is mostly focused in the area of Yemans, Evaline and Belmont near Alpena. In all three development projects the plaintiffs – and their descendents — of the housing lawsuit have first dibs on the houses. The history of the housing lawsuit has taken many twists and turns over the years. After the first round of houses was constructed a few years ago, city, county and state officials held a ribbon ceremony celebrating the closure of the lawsuit. Even the retired federal judge who oversaw the case, Damon Keith, attended the ceremony. Perhaps, it could be said, the celebration was premature. It won’t be until these last three development phases are completed that it can be said that the lawsuit is finally over. 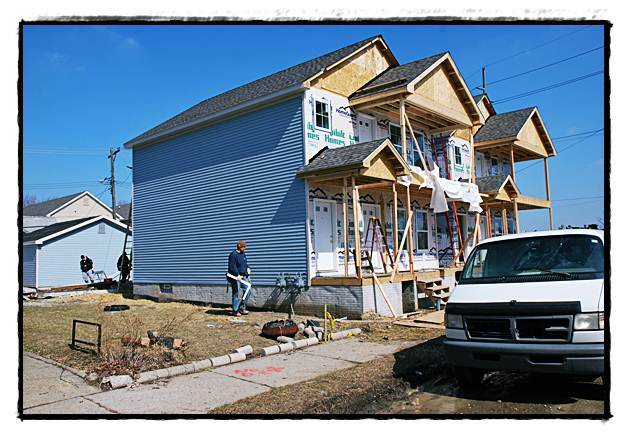 Regardless of the lawsuit, its ugly history, and the painfully long time it took to even pound the fist nail into the first house, the end result is more people will be moving into Hamtramck, and they will be able own a home at an affordable price. 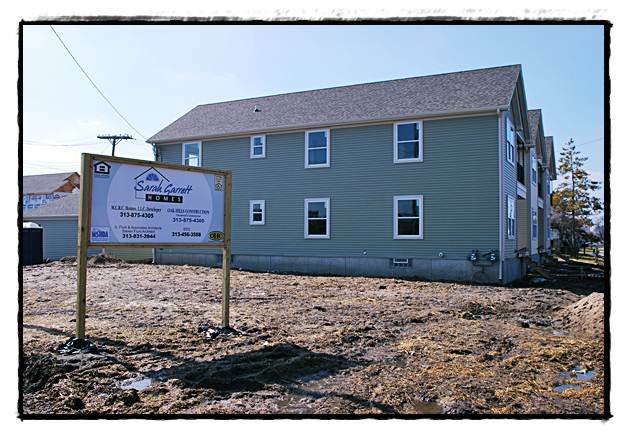 On Yemans St. at Alpena, three new two-family houses are going up. Saad Almasmary just purchased a brick bungalow next to the houses. Just weeks ago there were garbage strewn lots around Almasmary’s house. Now there are houses going up all around his neighborhood. One Response to Housing crisis? What housing crisis?